This eerie oil painting is Grandma’s Footsteps by Angela Lizon, and is one of my favourite artworks on show as part of the RWA exhibition Strange Worlds: The Vision of Angela Carter. Resembling a black and white photo, it shows an obedient little girl apparently gazing at the camera with a worried expression on her face. 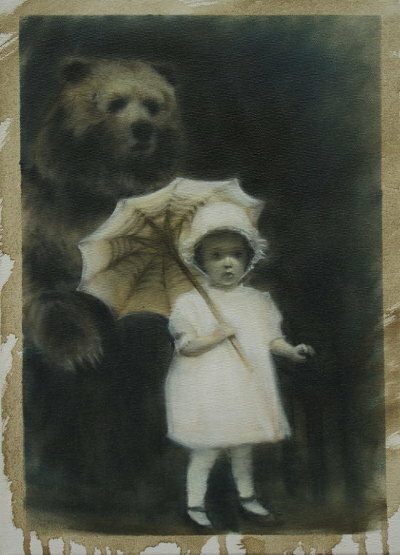 And no wonder, because a vast grizzly bear lurks just behind her. To me it encapsulates our parents’ and society’s expectations that we smile for the camera, regardless of what may be breathing down our neck. This week, consider a situation where someone may be expected to act against their instincts. How might they respond? What might the outcome of their actions be?